Please welcome Rebecca, a school counselor and the blogger behind CounselorUp. She’s sharing a great step-by-step guide on how to implement behavior contracts in the classroom and discusses all the different ways that can be used to find success for each student. 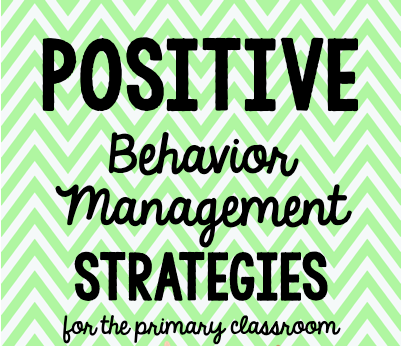 Managing behavior is probably the most frustrating and difficult part of teaching. You’ve worked hard on a lesson, made it interesting and engaging, and one of your students has a different plan in mind. To make it worse, 90% of your students really want to learn and are excited to participate. Wait… Ten percent of my kids aren’t participating. What do I do? Think about your pyramid. 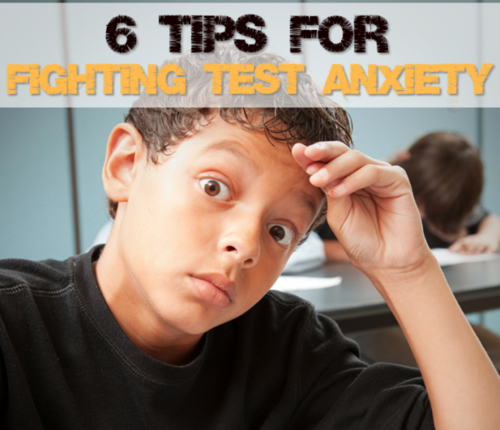 Are 80% of your kids engaged with little to no extra intervention? Do an additional 10% need only light interventions like redirects and short breaks? If your answer is no, then you probably need to rethink how your classroom management system is working. There are lots of wonderful ideas for classroom management systems on my Pinterest board, Ain’t Misbehaving; please check it out! Today’s post will be focusing on your Tier III, high needs kiddos. 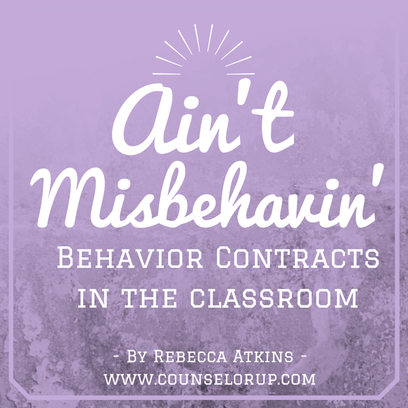 If you created a behavior contract for half your class, you would never get any actual teaching done! You have the majority of your kids working and ready to participate, but you have one or two friends that aren’t responding to your best practices. You’re ready to start an intervention. Behavior contracts are a great place to start! 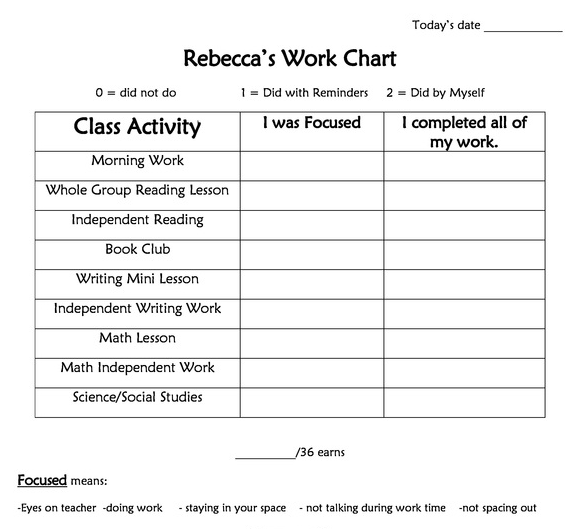 Think of a behavior chart as an individualized monitoring system. It gives both the student and the teacher feedback on how the day is going. In addition, it gives the student a reward or incentive for being a valuable member of the class. That’s a good thing! Now that you’ve made a plan for how you will chunk your day, decide what behavior you are looking for. 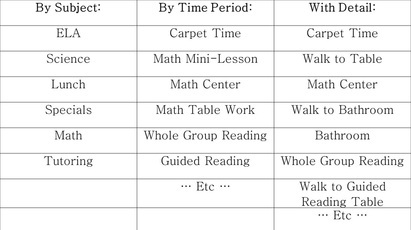 I usually ask teachers, “What is the one thing that would make your day go more smoothly?” I typically start behavior contracts with only two behaviors and never more than three. Nobody is perfect, and your special contract friends have a long way to improvement; set them up for success! The behaviors you identify should be observable and measurable. Write a short indicator for the behavior at the top of your table, and now you have a contract! 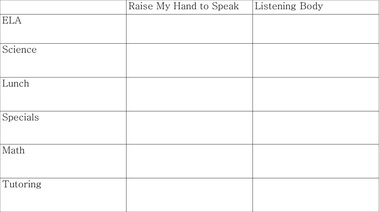 Now that you’ve created a chart, decide how you want to record the student’s behavior. I’ve used a number systems, such as smiley faces and checks. I find that checks work best. Number systems seem great for providing a range of compliance (2 = independently, 1 = with reminders, 0 = not today), but I find that students are confused by the ratings and get frustrated more easily. Smiley faces are cute but hard to read quickly. Of course, kids love stickers but this makes record keeping more challenging and can lead to inconsistently implementing the chart by the teacher. with the Minds in Bloom readers! On my rewards chart, I include two types of rewards: every day rewards and save up rewards. Every day rewards are smaller and, as the name suggests, can be earned every day. Save up rewards are larger or require more time out of class or with me and have to be earned over time. These rewards are highly desirable rewards like lunch with me, library helper, or extra recess. Students have to earn their chart four days in order to receive a save up reward. The chart does not have to be earned four days in a row. Once the student understands the chart and is excited for the rewards, I spend a few minutes talking about the behaviors that I will be looking for. If our goal is listening body, we’ll talk about what that looks like. I write the explanation at the bottom of the contract so it’s always visible, or I make a reminder card for their desk with visuals for younger students. Once the student is on board, it’s time to start using the chart! So how do you know when your precious lovely has earned their reward? My ultimate goal is to earn 80% of their checks each day, but remember that these students have been your toughest 10% in their behavior. Start the bar low so they can feel success and then increase over time. I usually start at 50% of checks and move up after they’ve been successful for a few days. I know, you want to scream, “Half?! 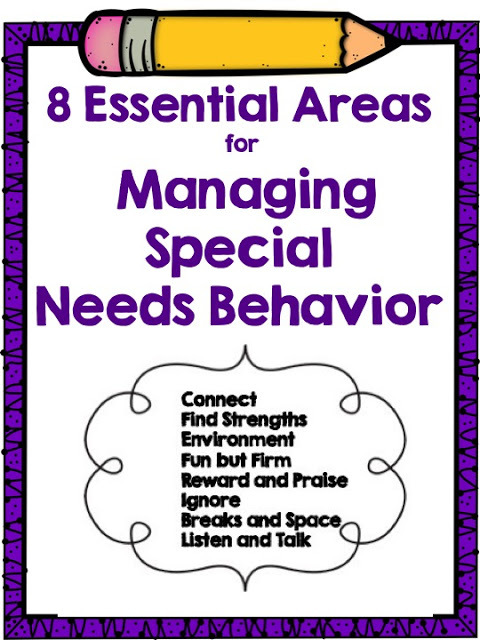 That’s nothing!” The purpose of the chart is to increase positive behavior by rewarding it. The student needs to feel the success of the reward in order for it to work. How do I know if it works? It’s amazing sometimes how, in our daily frustration, we can feel like something is not working even when it is. To help think about progress in an objective way, I have created a progress monitoring chart to track behavior over time. I input the percentage of checks earned for each day, and the chart creates a graph with a trendline over time. I can look and see if the trendline shows upward movement (yay! ), stays the same (are we maintaining? ), or shows a downward trend (oh no!). I am a counselor, so I create these for each of my teachers who has a student on one of my contracts. I also create a chart when a student is being monitored through an intervention team so they can use this information in their meetings. I always share the chart with students, as well, to celebrate successes or to brainstorm ways to improve. You CAN do it! I’ve written over 1000 words on behavior contracts, and I hope you aren’t feeling overwhelmed. Remember to use this great technique for a very small number of students. 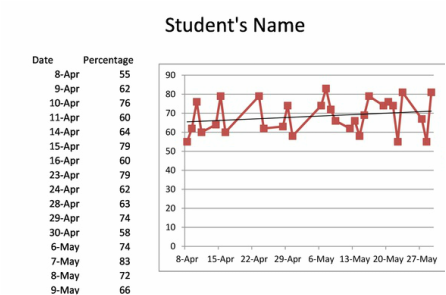 If you would like to download a bundle of 15 different behavior charts and the progress monitoring excel file, it is available in my Teachers Pay Teachers store. Rebecca Atkins is a school counselor in North Carolina. She is passionate about helping all students learn and be successful in school. She’s an intervention and progress monitoring geek, book lover, and just a tiny bit compulsive. You can find more at Counselor Up.